While John McCain and Sarah Palin are planning to attack Obama based upon guilt by association, Daniel Herman at The History News Network reviews Sarah Palin’s association with the Alaska Independence Party asking Can Sarah Palin Say the Pledge of Allegiance in Good Conscience? Can Sarah Palin say the Pledge of Allegiance in good faith? Can she take the Oath of Office in good faith? No, she can’t, as I’ll explain below. Remember when in 2003 Michael Savage said he’d like to rip “traitors” from their cars and beat them senseless because they exercised their constitutional right to speak against the war? Unlike Savage, I want to talk about real traitors: enemies to the Constitution. As you HNN readers probably know, Sarah Palin has supported the idea of allowing Alaskans to vote on whether to leave the U.S. McCain’s flacks insist that she never really wanted Alaska to leave, but even they–extraordinary liars–refuse to say whether she supported a vote on the matter. No one can ask her about it because she won’t dare talk to the press, but obviously she has supported such a vote, else the McCain people would have said otherwise. More evidence: as you also probably know, in 2006, Palin told members of the Alaskan Independence Party (as in independence from the U.S.) that they were “inspirational,” adding “God bless you and keep up the good work.” Their chairman called her “our candidate.” For seven years her husband, her “closest advisor,” was a member of the AIP (see the LA Times of September 3, 2008). Now consider: the oath of office will require Palin to swear on a Bible to uphold and defend the Constitution against all enemies, foreign and domestic. Secessionists are domestic enemies. I suspect that some have ties to militias that would love to bring down our government. I’m not saying that Palin has such ties, but it is likely that some AIP members do. The founder of the AIP said he had “no use for America or her damned institutions,” and vowed not to be buried on U.S. soil. He was murdered while purchasing plastic explosives (like a drug deal gone bad, but in this case an explosives deal gone bad). One wonders what he was planning to do with those explosives. If Palin cannot take the oath, neither can she say the Pledge. The Pledge commits us to “ONE nation, under God, INDIVISIBLE,” words explicitly meant to deny the right of secession. If Palin recites the Pledge while believing in the right of secession (even if she does not think Alaska should secede), she violates its meaning. Either she is too shallow to realize the Pledge’s meaning or she doesn’t care. Sarah Palin cannot take the oath of office or recite the Pledge of Allegiance without making a mockery of both of them, yet somehow our press has ignored that fact. President Palin? God help us. With McCain on the wrong side of the issues and trailing badly in the polls, he is prepared to go even more negative in the hopes of pulling out a victory in November. This will include raising Obama’s ties to Ayers and Rezko even though these smears have previously been debunked. “Three quarters of a million jobs lost this year. Our financial system in turmoil. And John McCain? Erratic in a crisis. Out of touch on the economy. No wonder his campaign wants to change the subject. A senior Democrat who has had contact with Obama’s high command points to Democratic strategist Paul Begala’s comments on this morning’s Meet the Press. Begala noted that McCain once “sat on the board of a very right wing organization,” the U.S. Council for World Freedom, led by a retired Army Maj. General named John Singlaub. The Anti-Defamation League allegedly called the CWF’s parent organization a gathering place for racists and anti-Semites. Other potential negative associations for McCain are his long-time South Carolina consultant, Richard Quinn, a publisher of a Southern heritage magazine, and John Hagee, a pastor whose endorsement McCain solicited and later rejected. Sen. Barack Obama on Sunday charged that Sen. John McCain’s campaign is launching “Swift boat-style attacks” on him instead of addressing the country’s problems. “Sen. McCain and his operatives are gambling that they can distract you with smears rather than talk to you about substance. They’d rather try to tear our campaign down than lift this country up,” Obama said at an event in Asheville, North Carolina. “That’s what you do when you’re out of touch, out of ideas, and running out of time,” he said. It is a sad denouement for what was one to be a high-minded campaign focused around themes of honor and reform (themes that were resuscitated briefly during the Republican Convention), possibly accompanied by McCain’s taking a one-term pledge. It is also, however, Mr. McCain’s strategists would seem to have concluded, their only remaining hope. I am not here to dispute that this is McCain’s best strategy — in the same way that an onside kick is a team’s best strategy when it trails late in the game with no timeouts left. But like the onside kick, it is fairly unlikely to work. The problem for McCain is that resorting to this type of attack further damages the impression that McCain is different from other Republicans. Just as dirty attacks from Hillary Clinton backfired and helped Obama win the nomination, such dirty attacks from McCain will further demonstrate to voters that change is needed in politics, leading more independents to back Obama. Even Hillary Clinton was careful about using attacks based upon Rezko and Ayers, leaving much of this to the media. If less offensive attacks by Clinton backfired against her, there is a far greater chance that these attacks will harm McCain more than they will harm Obama. Having announced to the media that this is his strategy will make it even more likely to succeed, and raises further questions as to the competence of McCain’s campaign. In recent years Republicans have been incompetent at governing but highly skilled at launching Swift Boat attacks. Currently McCain appears to be incompetent at both matters of public policy as well as at launching Republican smears despite turning to Karl Rove staffers. Barack Obama now has a chance to sweep the Big Ten in November, which is significant as this would clinch victory in the electoral college. As John McCain is unlikely to hold on to all the states which George Bush won in 2004 he must pick up some of the states Kerry won. Earlier he was hoping to win in some of the Big Ten states but his chances are dwindling. McCain has already given up on Michigan. His hopes in Minnesota are looking poor with a new poll showing Obama leading 55% to 37%. Obama increased his lead in another state which McCain had hope to pick up, Pennsylvania, with the latest poll showing him leading 51% to 39%. While it is increasingly looking like McCain cannot pick up any victories in states won by Kerry in 2004, Obama stands an excellent chance of picking up some red states. Iowa has been strongly for Obama. Obama has moved into a lead in Ohio at 49% to 42%. Even Indiana, the most conservative state in the Big Ten, is now too close to call making a sweep of the Big Ten region possible. Does this mean Obama gets to go to the Rose Bowl as well as the White House? While the Big Ten states might decide the election, McCain’s weakness in states which belong to other conferences is what makes improvements over Bush in the Big Ten so crucial for McCain. Obama has a shot at picking up wins in Atlantic Coast Conferences states including Virginia, North Carolinia, and Florida. Obama also stands to make some gains in the Big Twelve, incluidng Iowa (which has schools in both the Big Twelve and Big Ten), Colorado, and even one electoral vote in Nebraska. Earlier I posted a video of Brian Williams appearing on The Late Show With David Letterman from Friday night. Dave also commented on the debate. I’ve subsequently found that it is unusual for Letterman to have a show taped on Friday. He normally tapes his Friday show on Monday after he tapes the regular Monday night show, but this week he wanted to postpone taping so he would be able to comment on the debate. McCain should have never gotten Letterman so angry at him. During the monologue Letterman said that when anyone asked if he watched the debate his answer is “Oh, you betcha.” He reported that Sarah Palin’s family was watching during the debate and half way through her future son-in-law made a run for it. He noted that during the debate Palin winked, wrinkled her nose and gave a shout out to a third grade class. “That says commander-in-chief to me.” He explained that Sarah Palin keeps invoking Joe Six-pack because “her answers make more sense after six beers.” He said that John McCain liked the interiew–he applauded so many times that all the lights in his house kept going on and off. Full video of the monologue is available here. Letterman presented spliced messages from Sarah Palin which are included in the video above: “It’s so obvious I’m / not ready to be / vice president,” “But I will tell Americans straight up that I don’t / know what a vice president does,” and “I have / no / experience. John McCain / should / get rid of / me.” Also check out the Sarah Palin Debate Recap in the video. Brian Williams appeared on The Late Show With David Letterman Friday night (video above) and began by announcing, “I’m a maverick and I may not answer the questions tonight.” He actually did answer questions, including reasons to be concerned about Sarah Palin becoming vice president. 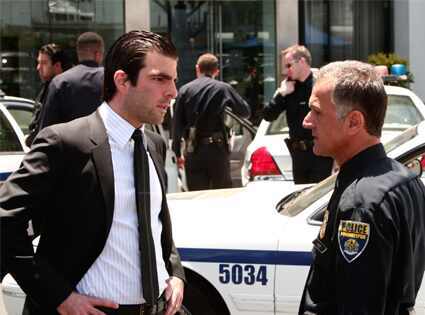 Williams cited a scenario such as that it is September 11, the president is in a plane and the Secret Service won’t let him land, and the vice president is in the White House and in control. The detailed responses are bad news for Mr McCain (the full data are available here). Eighty per cent of respondents and no fewer than 71% of those who do not cleave to either main party say Mr Obama has a better grasp of economics. Even among Republicans Mr Obama has the edge: 46% versus 23% say Mr Obama has the better grasp of the subject. “I take McCain’s word on this one,” comments James Harrigan at the University of Virginia, a reference to Mr McCain’s infamous confession that he does not know as much about economics as he should. In fairness, Mr McCain’s lower grade may in part reflect greater candour about his weaknesses. Mr Obama’s more tightly managed image leaves fewer opportunities for such unvarnished introspection. There is an apparent contradiction between most economists’ support for free trade, low taxes and less intervention in the market and the low marks many give to Mr McCain, who is generally more supportive of those things than Mr Obama. It probably reflects a perception that the Republican Party under George Bush has subverted many of those ideals for ideology and political gain. Indeed, the majority of respondents rate Mr Bush’s economic record as very bad, and Republican respondents are only slightly less critical. On our one-to-five scale, economists on average give Mr Obama’s economic programme a 3.3 and Mr McCain’s a 2.2. Mr Obama, says Jonathan Parker, a non-aligned professor at Northwestern’s Kellogg School of Management, “is a pragmatist not an ideologue. I expect Clintonian economic policies.” If, that is, crushing federal debt does not derail his taxing and spending plans. On his plans to fix the financial crisis, Mr Obama averages 3.1, a point higher than Mr McCain. Still, some said they didn’t quite know what they were rating—reasonably enough, since neither candidate has produced clear plans of his own. Where the candidates’ positions are more clearly articulated, Mr Obama scores better on nearly every issue: promoting fiscal discipline, energy policy, reducing the number of people without health insurance, controlling health-care costs, reforming financial regulation and boosting long-run economic growth. Twice as many economists think Mr McCain’s plan would be bad or very bad for long-run growth as Mr Obama’s. Given how much focus Mr McCain has put on his plan’s benefits for growth, this last is quite a repudiation. Mr McCain gets his highest mark, an average of 3.5 and a clear advantage over Mr Obama, for his position on free trade and globalisation. If Mr Obama “would wake up on free trade”, one respondent says, “I could get behind the plans much more.” Perhaps surprisingly, the economists rated trade low in priority compared with the other issues listed. Only 53% say it is important or very important. Neither candidate scored at all well on dealing with the burgeoning cost of entitlements such as Medicare and Social Security. The economists also prefer Mr Obama’s tax plans. Republicans and respondents who do not identify with either political party see Mr McCain’s tax policies as more efficient but less equitable. But the former prefer Mr McCain’s plans—43% of Republicans say they are good or very good—and the latter Mr Obama’s. Of non-affiliated respondents, 31% say Mr Obama’s are good or very good. Either way, according to the economists, it would be difficult to do much worse than George Bush. The respondents give Mr Bush a dismal average of 1.7 on our five-point scale for his economic management. Eighty-two per cent thought Mr Bush’s record was bad or very bad; only 1% thought it was very good. The Democrats were overwhelmingly negative, but nearly every respondent viewed Mr Bush’s record unfavourably. Half of Republican respondents thought Mr Bush deserves only a 2. “The minimum rating of one severely overestimates the quality of Bush’s economic policies,” says one non-aligned economist. Obama is becoming more critical of McCain’s health care plan in his campaign appearances and ads. I have been urging this for quite a while as, besides doing little to help the uninsured, McCain’s plan is harmful to those who currently have insurance coverage and harmful to businesses. While Republicans have been successful by resorting to scare tactics about Democratic health care proposals in recent years, this year it is the Republicans who offer a plan which most Americans have real reason to rear. If you think that “The Market”—whatever market—always works for the best, you’ll love John McCain’s version of health insurance reform. It uses the tax code to shove you toward individual policies (more “choice!”) and away from comprehensive, employer supported plans. The nonpartisan Tax Policy Center puts the cost of his proposed subsidies at $1.3 trillion over 10 years. But a funny thing happens on the way to spending that much money. Almost all of the subsidy goes to people who have health insurance already, says Sherry Glied, a professor of health policy at Columbia University. The Tax Policy Center figures that, after 10 years, the plan cuts the number of uninsured by only 1 million, out of 45.7 million now. Barack Obama’s $1.6 trillion plan would take 34 million off the rolls of the uninsured. • If you‘re uninsured, the tax credit helps you purchase coverage . The only hitch—a big one—is that you have to be able to afford the premiums up front. The tax credit comes later. The government will send it to the insurance company, which will apply it to your account. To see how much the McCain plan helps, I asked Scott Leavitt, president of the National Association of Health Underwriters, to price typical policies for healthy singles, couples and families in the Chicago area. It appears that the credit could pretty much cover the premium in your 20s and 30s, even early 40s, making it a good deal. At 55, however, a couple might pay more than $12,000—difficult for older people with modest incomes. • The Tax Policy Center estimates that 20 million workers will leave the employer-based system, not always voluntarily . Midsize and smaller companies are likely to drop their plans and tell you to use the credit to buy a policy yourself. • It‘s a shock to move from group plans into the harsh world of individual insurance . You get “choices” (rah, rah). But the policies cost more and cover less than company plans do—especially for women, older people and those whose health is less than perfect. That is, if you can find coverage at all. In 2006, the Commonwealth Fund studied working-age adults hunting for individual policies. One fifth were charged more or rejected for health reasons. More than half found it hard or impossible to secure a policy they could afford. McCain’s plan is based upon the faulty assumption that the best way to reduce health care costs is to transfer more of the cost to individuals. Conservatives love health plans that throw more of the costs on you. When it’s hard to pay the bills, you see the doctor less. Through the “magic of the marketplace,” that’s supposed to slow the rate of increase in medical costs. Friends, there’s zero evidence that that works. In the long run, tax credits will raise your costs without changing the game. And we still won’t have helped most of the uninsured. Additional problems with McCain’s plan were recently reviewed in a report from The Commonwealth Fund. Obama’s campaign has also posted an eleven page pdf on “Five Pitfalls of the McCain Health Plan. 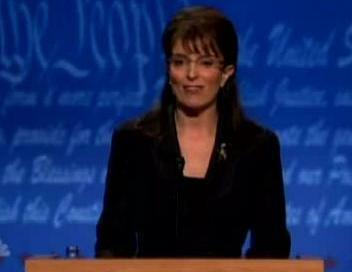 Tina Fey returned for a third time to portray Sarah Palin on Saturday Night Live as the show satirized the vice presidential debate. Queen Latifah played moderator Gwen Ifill and before the debate began announced, “Due to the historically low expectations for Gov. Palin, were she simply to do an adequate job tonight, at no point cry, faint, run out of the building or vomit, you should consider the debate a tie.” Tina Fey came on stage and blew a kiss to the audience, just as in the real debate. Also as in the real debate, she repeatedly avoided answering questions. Instead she would repeatedly say what she wanted to talk about instead, such as being an outsider. There were plenty of uses of the word Maverick, including an extra one to help out those Joe Six-Packs playing a drinking game at home, and even a wink. Video of previous appearances by Tina Fey are here and here. This week’s video is available here, and I will add it here when NBC releases a copy for embedding. SNL will be off next week and further appearances by Fey will be decided on a week by week basis. There will also be three prime time episodes of Weekend Update on Thursdays leading up to the election.